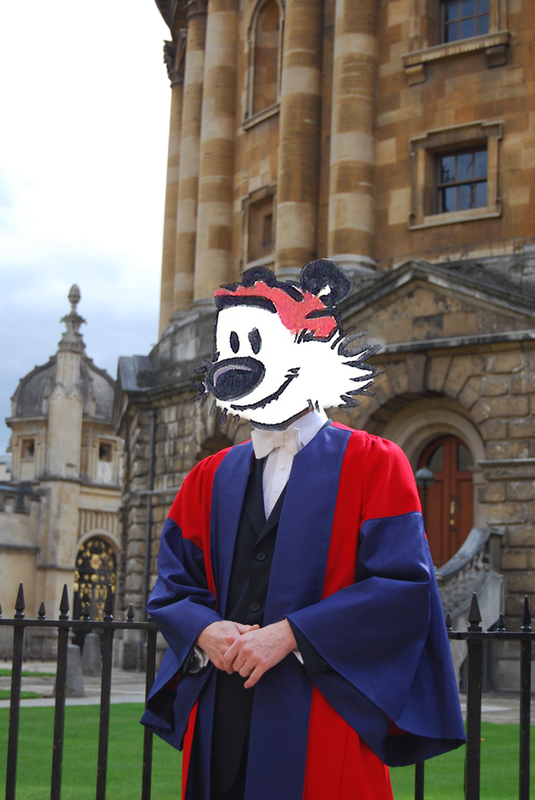 Before heading out for Beijing, Lei and I were visited by our teachum who goes by the Internet pseudonym Apache - possibly the world's nicest research scientist, and sometime purveyor of mighty teacakes. This visit, he suggested a concentrated session in which we would drink 7542 through the ages. Genius. The batting opened with the familiar 2009 Dayi version. When I last tried this cake, it was in the year of its birth. Some two years later, and it has definitely aged - it is darker, and richer. 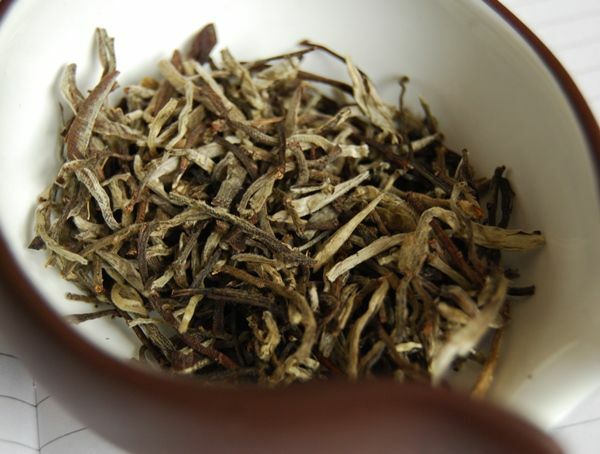 The massive astringency remains, but it is combined with a slightly transformed version of the Dayi "house flavour". Happily, it is vibrant and cooling. I've not tried the 2010 or 2011 versions, and this reminds me to do so. Skipping 2008, we move onto a 2007 Xizihao version. I would not have guessed this, but the bitterness has almost entirely dissipated. It is sweet, and yet cereal, having diverged significantly from the usual 7542 character. The leaves, shown above, have darkened nicely. Shown below, the soup remains a very definite yellow. Compared with the 2009 Dayi, this has little in the way of huigan, and is less "full" in the body. Perhaps this will pick up again in future - I have a few cakes that have "gone quiet" at 3-4 years, only to revive at a later point. This is a dark cake, which can perhaps be seen in the image below. It was pressed by CNNP, and stored in Hong Kong until mid-2009, at which point it was bought by Apache and brought back to Blighty. It is, also, a surprisingly thin cake, as pictured below. 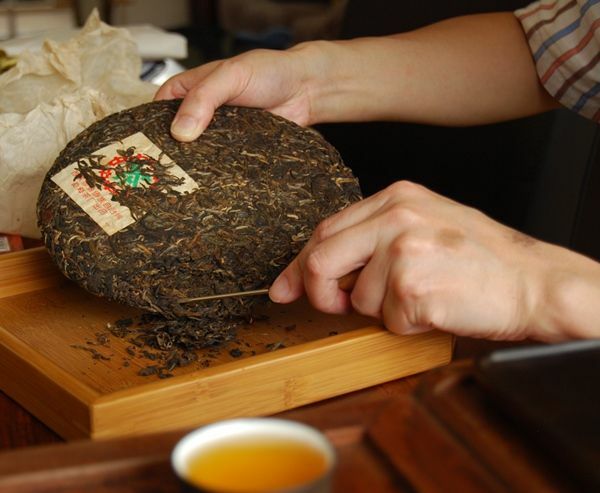 The density of compression is such that the little tea-knife (kindly provided by China Chadao, I seem to recall) is required to liberate some leaves from the bing. This is the first of the 7542s to exhibit any real age in the colour of its soup, which, as you may be able to see from the gongdaobei shown below, is heading towards a big, fat orange. There is no hint of "Hong Kong" storage; I was anticipating a small amount of humidity to be evident, but it tastes decidedly neutral. It is a touch quiet, as if it has not yet swollen into the fullness of age. Curiously enough, there was something "fishy" (to me) in its vegetal, almost bean-like, character. 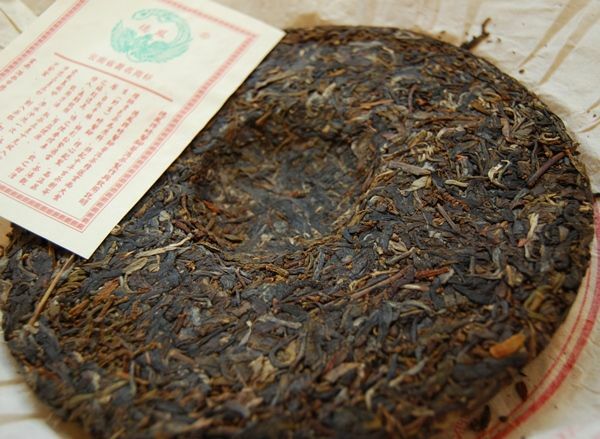 Completing the first half of the session, working in reverse chronological order of cake production, we came to the 2003 Menghai, pictured below. Apache bought this cake from the same shop in Hong Kong as the 2004. He recalls that, at the time of purchase, this 2003 was significantly less astringent than the 2004 version. Again, it is a CNNP pressing. Again, the tea-knife is needed - pictured below, Apache uses his native Hong Kong gongfu skills to address the issue of tight compression. Like its 2004 sister version, the 2003 is quite "dry" in its characteristics, with ne'er a hint of humidity to be discerned. The leaves are a great deal less chopped than modern Dayi versions of 7542, as perhaps you can see in the image below. Dark wood, malt, and other signs of life appear in the later infusions of this cake, as it begins to open up before us. 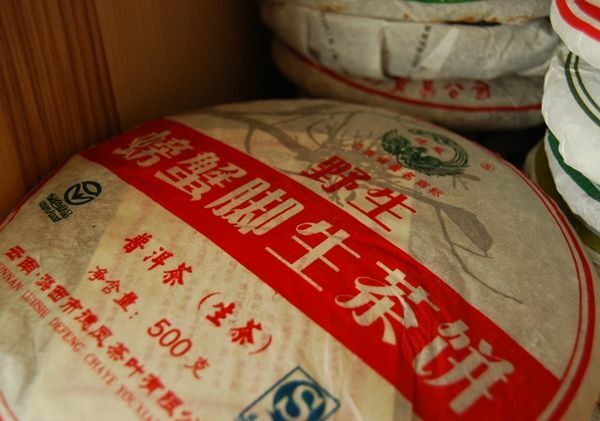 A more "mineral" character than its sister cake lingers in the leaves, perhaps residue of its humid, natural storage conditions while in Hong Kong. It has developed into a very pleasant, and highly enjoyable, cake. If our modern Dayi versions tend towards these characteristics, there is sign for hope - and there is evidence to suggest that some of the modern Dayi cakes are at least tending in this direction. We paused to collect our thoughts, before embarking on 7542 through previous decades - saving the best 'til last, and enabling some soothing of our stomachs after battling through the raw, unaged natures of the more modern cakes. 2010 Guyi - Yubang "Banzhang Jinya"
This is the last of the big pile of cakes that Keng recently provided - such generosity bears thanking again. 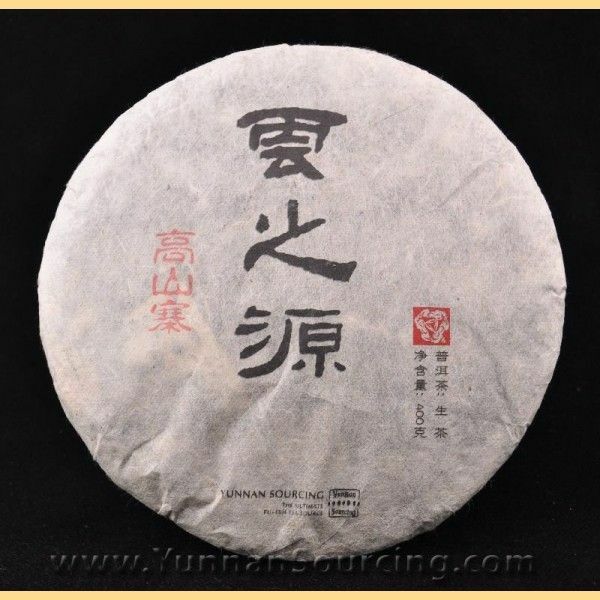 "Jinya" refers to "golden buds", which, as may be seen below, are well-represented in this cake's blend. I am usually a touch skeptical of such cakes, being milky and smooth, but not entirely great after periods of aging - but you never know. It is a fluffy, wispy cake. It is so loose and fluffy, in fact, that merely stroking the surface of the bing causes leaves to fall from it like autumnal blossoms, with a correspondent cloud of fur pluming up into the air. 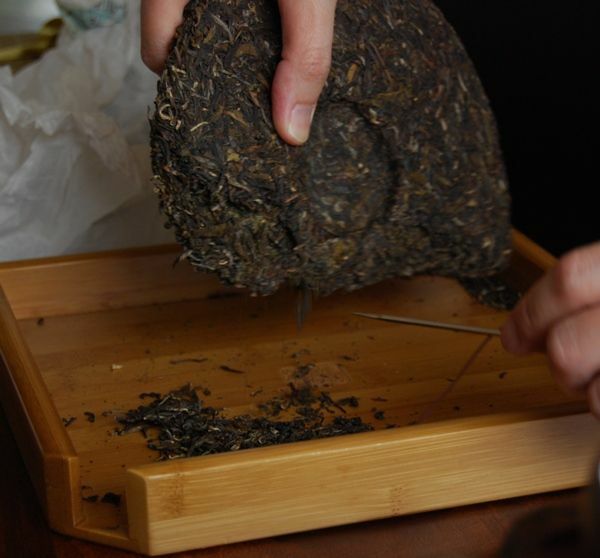 It is very easy to remove leaves: I could simply shake the cake a little, and receive enough for a session. 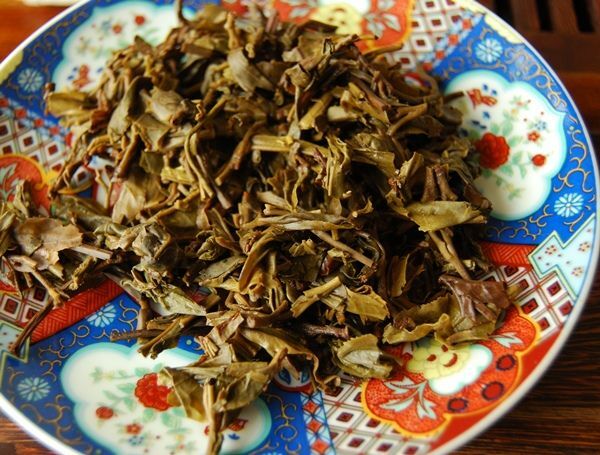 You have to admit, chunya [pure bud] leaves do look pretty, as pictured below. This has a yellow-brown soup, and packs a considerably punch, surprisingly. Perhaps we can thank the Banzhang (or Banzhang-area) leaves for that. 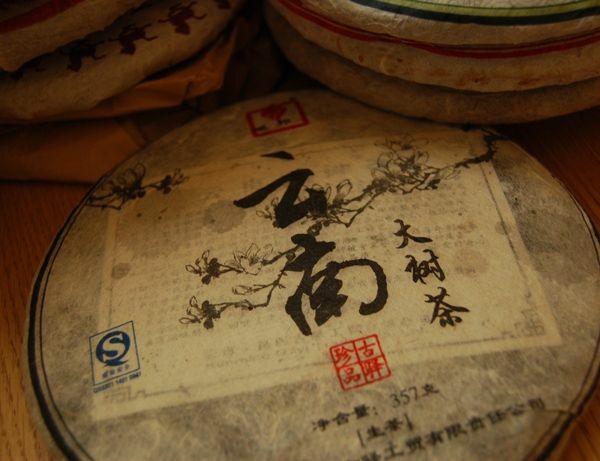 As with all furry, chunya cakes, it is exceptionally smooth, especially in the first infusions. I sometimes wonder if this is the effect of all that fur. It is sweet, and so very delicate. It is the perfect cake for a hot summer day. Unfortunately, this being England, it's cold and raining. C'est la vie. At 100 RMB via Taobao, this isn't a cheap cake (relative to mainland prices), and this is probably accounted for the double premium of being both chunya and being from Banzhang. It lasts well, unlike its peers in this genre, and has plenty of wildflowers - almost lavender - in the background that remind me of my family home in East Anglia. A charming session, with thanks to Keng both for this cake and for his munificence in providing so much good tea for us. 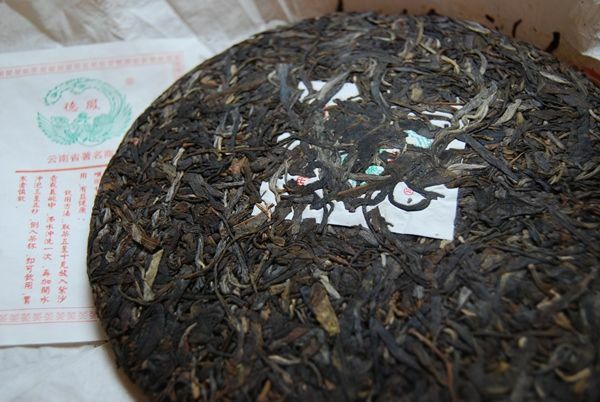 So, we meet at last, 2011 productions from Yunnan Sourcing. The circle is now complete. Scott's range this year have been announced via the brave new world of Google+ (primary differentiator: it's not Facebook). Google+ is quite amusing, in that every photograph I take with my new, strange little telephone seems to get uploaded to Google+. I learned this to my chagrin when I sneakily took a quick photograph of my wife washing some discrete items of clothing, which was subsequently uploaded automatically to The Google, causing much mirth (and punching of my face). This is Scott's flagship product for this year, weighing in at a Hailanghao-trembling $105, although you do get a full bing for your money this year. This cake is approximately double the price of the next cakes down the ladder, which are around $50. Doing the arithmetic of quality, I wonder if this tea is double the quality of those cakes below it. 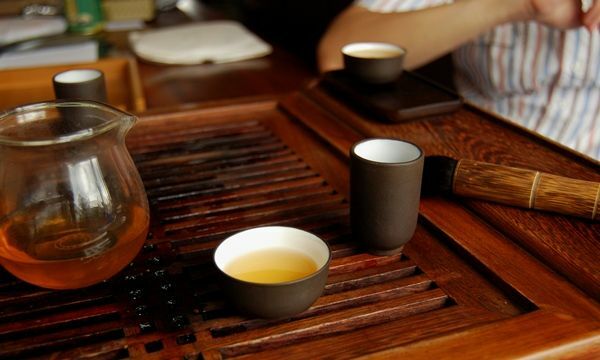 Such debates are dead-ends, and it just comes down to the tea, and whether you are happy to pay the price. "Gaoshanzhai" is an imaginatively-named village near Yiwu city, which of course means "High Mountain Village". 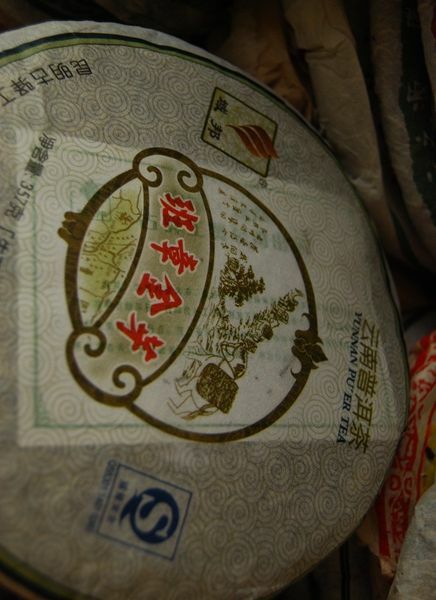 This cake is made from a blend of the maocha obtained from two different family tea-gardens. 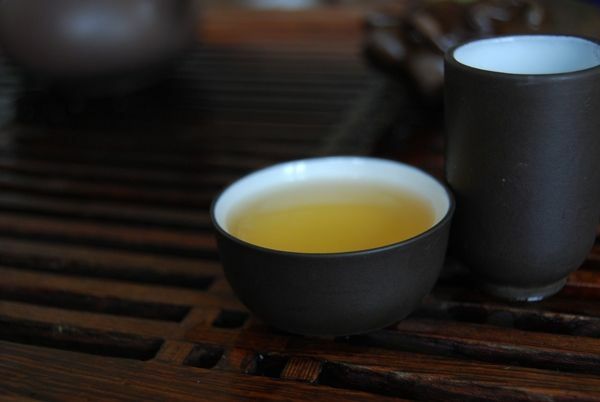 Perhaps Scott blended the two maocha for their complementary characteristics. We're expecting big leaves, buttery scents, and yellow soup, and all three are present in abundance. 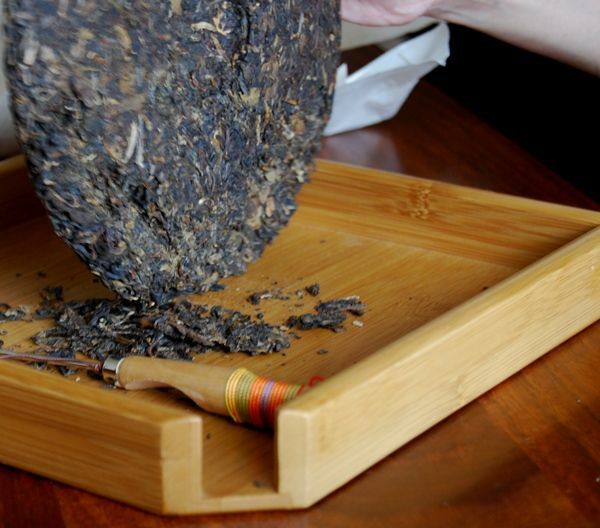 That said, the aroma, in particular, is surprising: instead of the usual butter, it opens with a fat flower-and-grain scent, which is very unusual for Yiwu, and very pleasant. This slowly, slowly tumbles into the buttery finish presumably imparted by the wok. 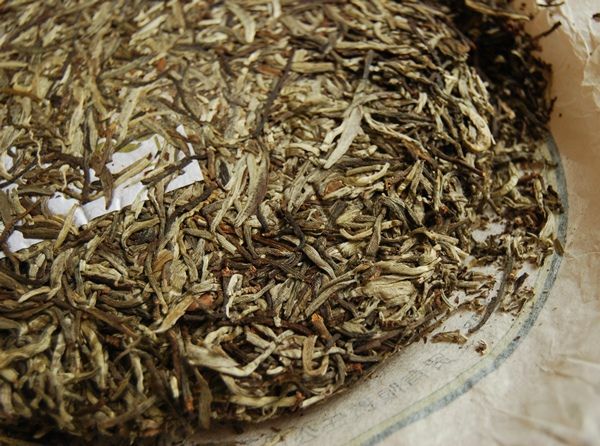 Tellingly, it stays big and interesting much longer than most teas' scents. Even the first brew, which was the briefest flirtation of leaf and water, is lively, vibrant, cooling, and long. 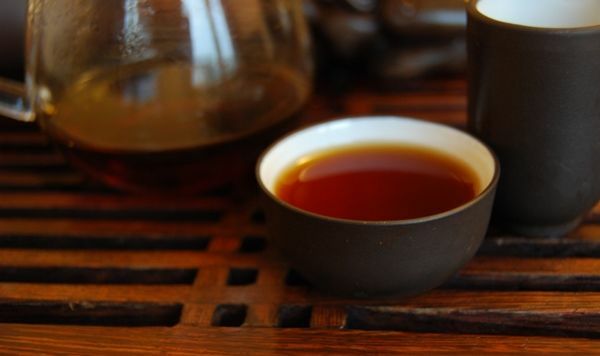 It is a fruity variant of Yiwu, and yet has the solid base of dark-straw Yiwu that I love in, among others, my old friends, the 2006 Xingshunxiang "Yiwuzhengshan" and my all-time favourite Douji, the 2006 Douji Dayeqingbing. That heaviness develops well with age, given the experience of my other cakes. 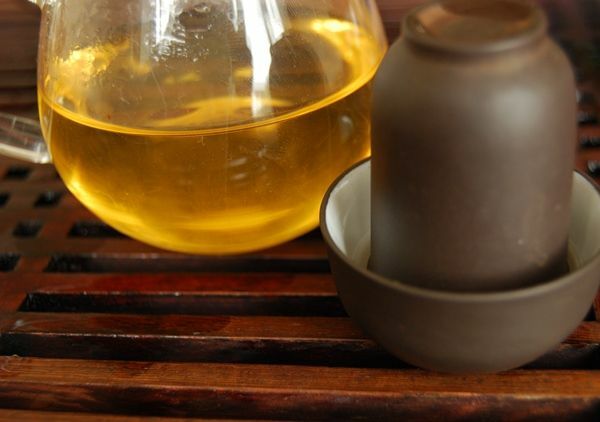 It is thick, mouth-watering, and reminds me of the good cakes from Essence of Tea. It is more expensive than the latter, but, dare I say it, approximately the same in overall quality. 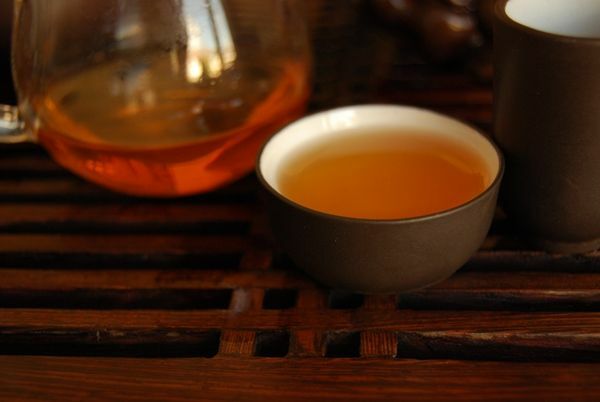 Finally, therefore, this powerful, busy, lively tea comes down to the mundane combat of price. Is it too expensive? For me, it is. 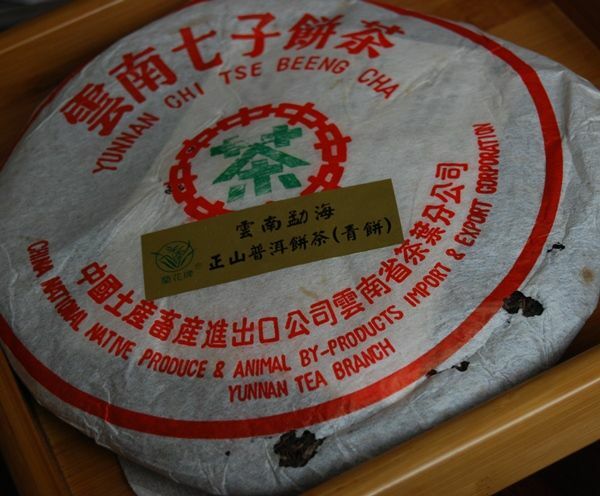 I like it very much, but I cannot justify paying the extra margin over the hand-made cakes I have acquired from other vendors, or from Yunnan Sourcing in previous years, which are around the same quality and have similar content. 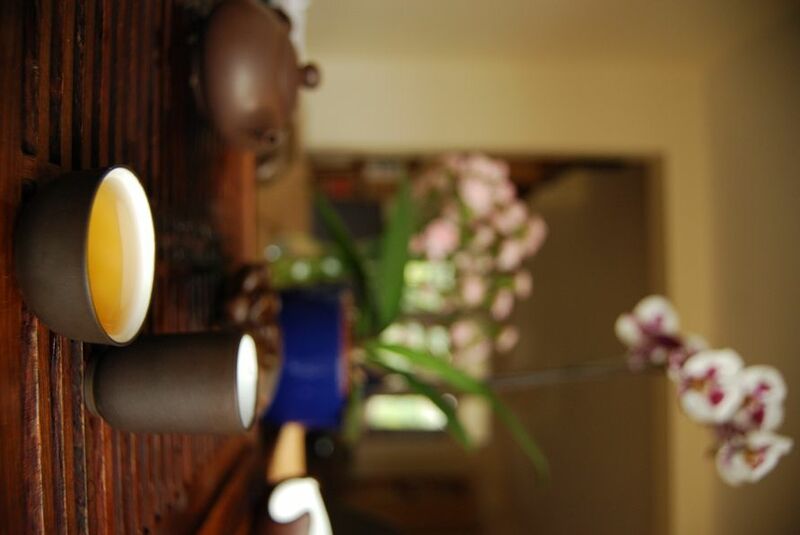 This is, naturally, a decision for every individual, but the quality of the tea is unquestionable. 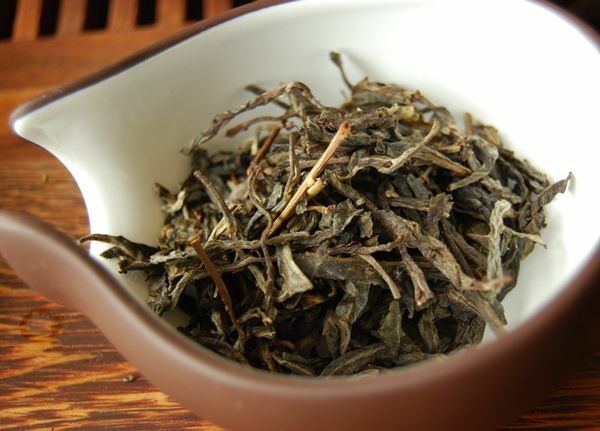 2010 Guyi - Yubang "Yunnan Dashu"
Guyi strike a good line between lowish prices and decent quality, I've come to appreciate (with thanks to Keng for the generous introductions). 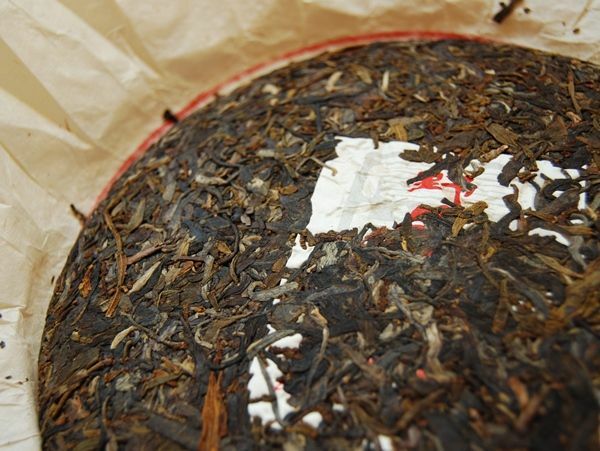 The 2004 "Gushu" was a brutal exercise into drinking powerful, sharp, woody tea. 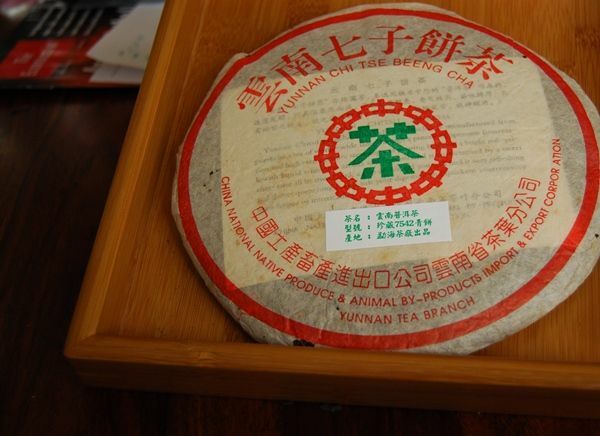 The 2008 Yiwu Zhengshan was raw, fresh, and solid - and available for a mere $28 at Tuochatea. 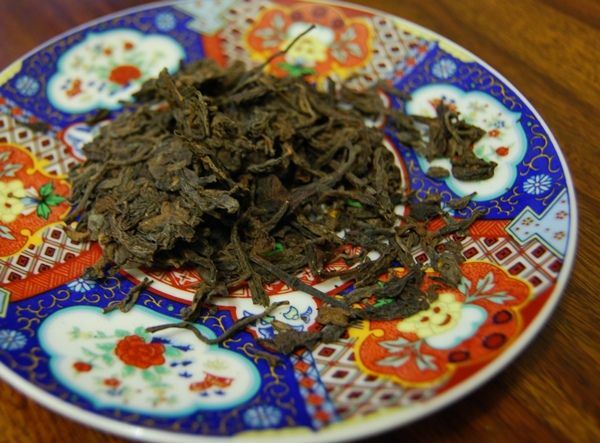 The 2009 "Mushu Chawang" was not daye pu'ercha, but a massively fruity novelty. 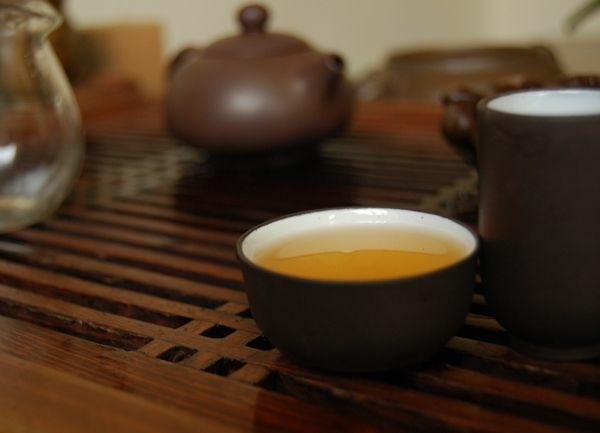 Guyi is based far away from the action, in the capital of Yunnan, Kunming, along with a zillion other pu'ercha companies and single-family teashops. 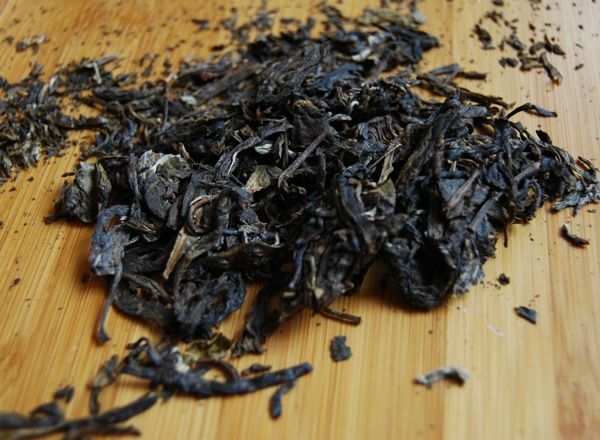 With a name like "Yunnan Dashu" [big tree], we can expect a blend. I rather appreciate blends, as I have mentioned before, because they can be stable, complex mixtures. Mongrels can often be stronger than thoroughbreds (and lack their genetic disadvantages). This Guyi cake has big leaves, and its loose compression reminds me of hand-made cakes, and gives it a pleasantly messy appearance, which reminds me of my cute little son with ruffled hair after getting out of bed. There is a good sweetness about the dry leaves, and all seems happily unprocessed. 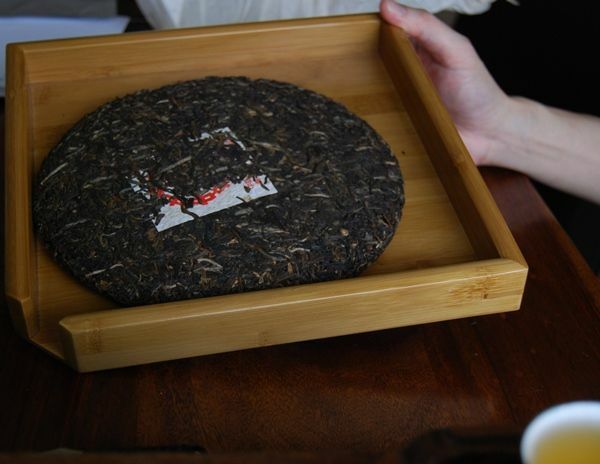 The sweet, buttery scent in the aroma cup takes me by surprise, and again reminds me of a hand-made cake (such as those produced by Yunnan Sourcing and Essence of Tea in latter years). 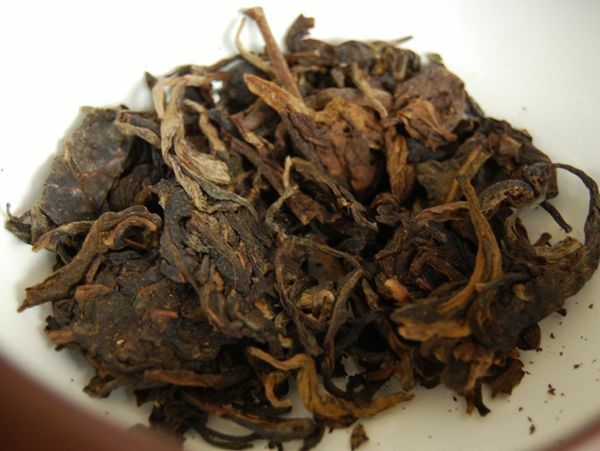 This has some of the fruits of the bizarre 2009 Mushu Chawang, and yet backs it up with a big, sweet body, a solid kuwei, and a certain granary charm. There is quite a lot in the soup, which encourages me. The used leaves are correspondingly green, without hint of redness As the infusions come and go, mainstream cakes would crack into pieces and become rougher in some fashion. This stays stable and delivers tons of contents from beginning to end, as if the leaves have a great deal of life in them, and are not easily exhausted. While it is not apparently available on Taobao, I determine to keep my eyes peeled for more. Thanks to Keng for a very solid bing, which gives me a bit more confidence in my positive outlook of Guyi's cakes. 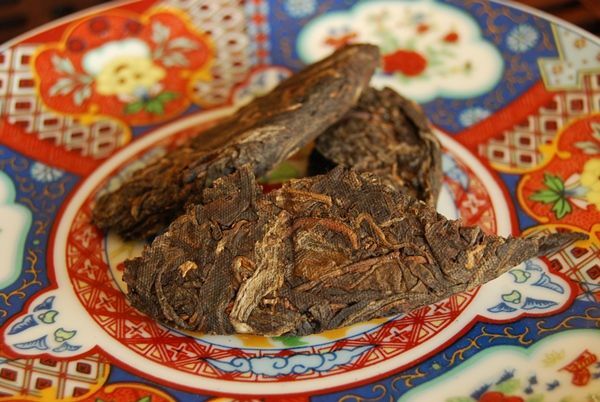 I have had a torrid time when it comes to 8582, the classical recipe from the Mighty Menghai. My recent cakes, admittedly, are great. The aged samples of 8582 that I have encountered, are not. Or, rather, to commit the cardinal sin of quoting myself, from a 1998 version, "This is a very pleasant tea. It is crisp, smooth, and sweet. However, it is distinctly impotent." Maximum overkudos, then, to the generosity of BH, who sent me the package above to put me out of my misery. 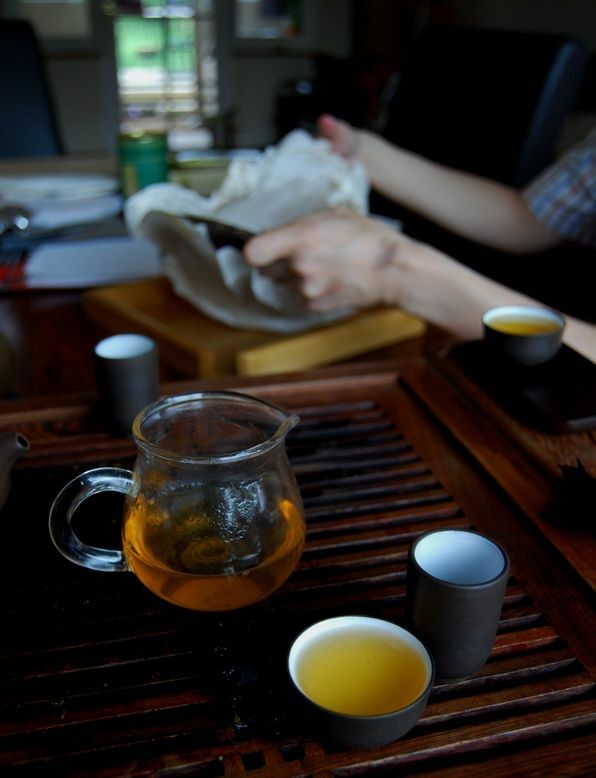 Learning from past tea sessions, I set this tea aside until I could give it the proper amount of time and concentration. In this instance, it was a Saturday morning when the Zhonglish ladies (Lei & Chinese Mama) took Xiaohu out to the shops for a few hours. You know you're getting old when you get the house to yourself and you drink tea. Unlike the disconcertingly green 8582 "aged" recipes from Tearoma, these leaves show us how it should be done: they are heavy, rusty orange. Hallowed be thy soup: this is thick, red, and has the reassuring aroma of heavy, oaken scents. 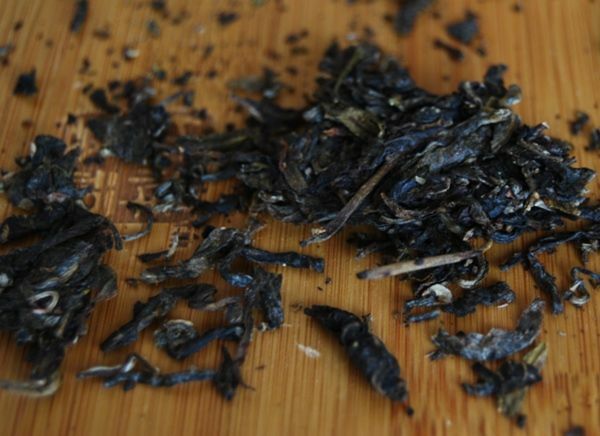 It is impossible not to fall in love with this tea: the body is lightly vibrant, heavily viscous, and yet it still retains the tangy edge of its youth. The storage has been first class. Wisps of vanilla remain in the nose, alongside a decent huigan and a solid cooling sensation on the roof of the mouth. 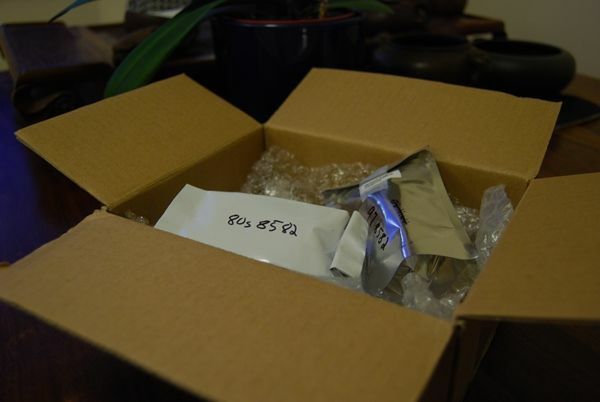 This tea is very much alive, and its years have been kind to it. Remarkably, there is all manner of nuance and subtlety in its character, which are present alongside its heavy burden of leaf content. 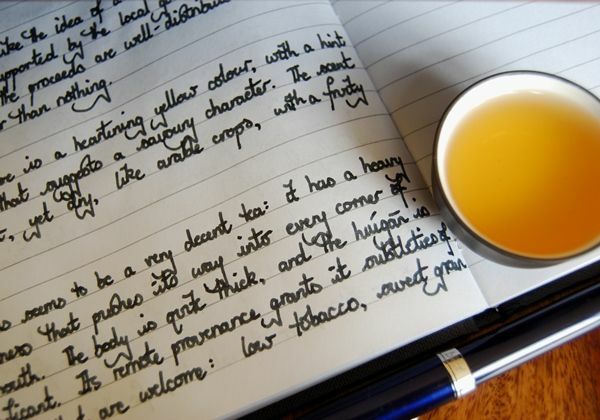 It brews many brews without loss of complexity, and gives me amply counterevidence in favour of this old recipe. Thanks to BH for the most triumphant tea session. See also: a retaste here. 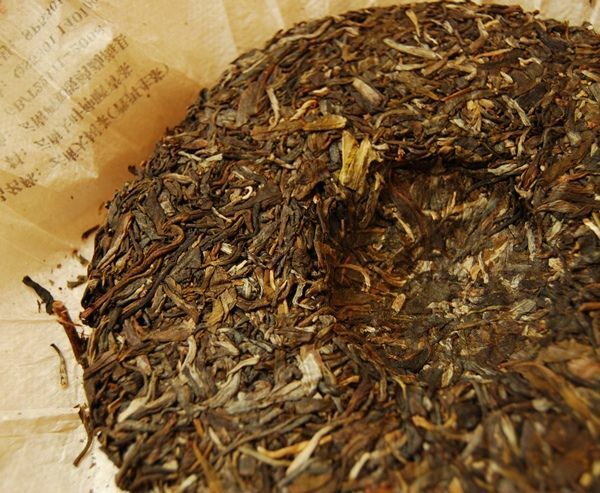 While our minds are on the products of the Luxi Defeng Tea Company, let's consider this Daye Qiaomu [dar-yeah cheow-mu, big-leaf arbor] cake, a sister of the 2010 Pengxiejiao, with its "crab's feet". 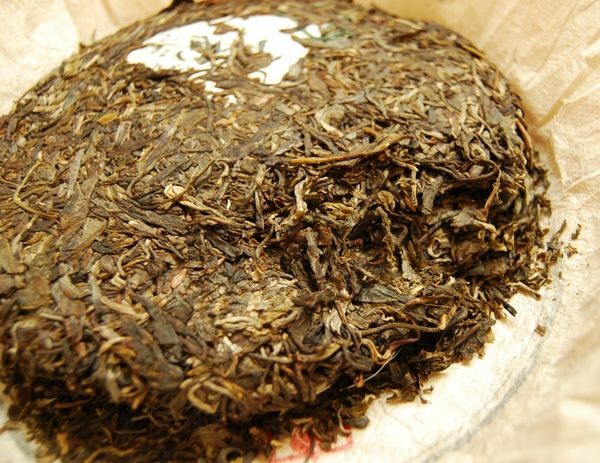 While its sister was available for 175 RMB on Taobao, and was probably a single-mountain cake, this cake is a blend of spring and autumn leaves from Gaoligongshan, a range famous for providing leaves for classical cakes, near the border with Burma / Myanmar. 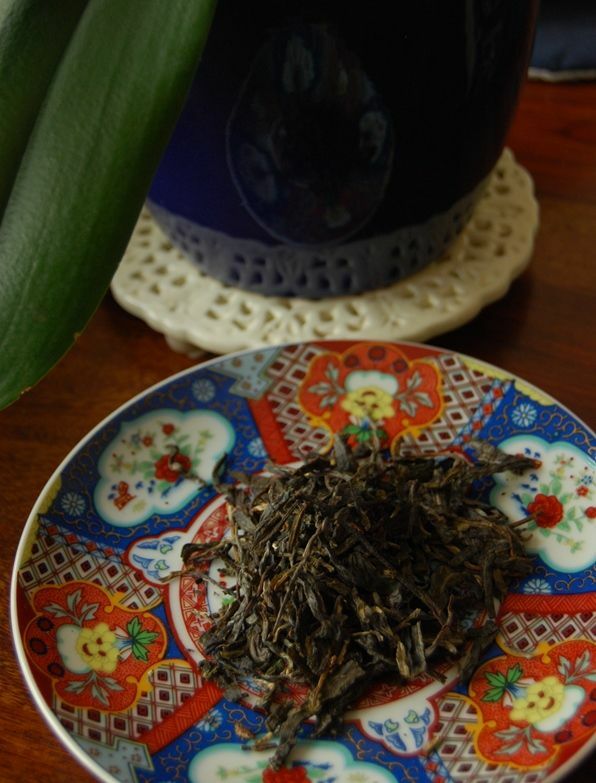 I have a whisky tube filled with 1960s Gaoligongshan maocha, which has come on very well. As we can see from the images of the cake, it is constructed using leaves of an appreciable size. Its compression is quite loose, like its sister cake. The dry leaves tell us quite a lot about the cake - these have a good, heavy sweetness about them, without hint of appearing "red". Perhaps you can see the solid darkness of the leaves in the photograph below, showing those that I prized free for a session. This is a good, yellow soup -shown below. 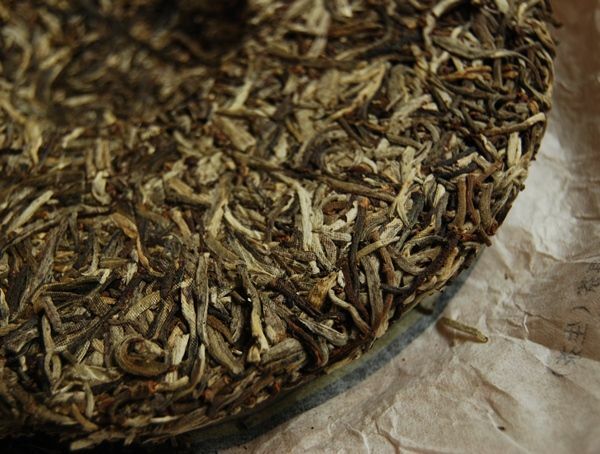 As with the other Defeng cake, it is a charming example of "outlier" pu'ercha, with, once again, a dry, cereal-crop character, atop a hint of smokiness. I am encouraged by the activity in the mouth, noticing a pronounced cooling sensation and general chunkiness that suggests plenty of sheer content. It is less "black", in the modern Xiaguan style, than its cousin, and this works to its advantage. 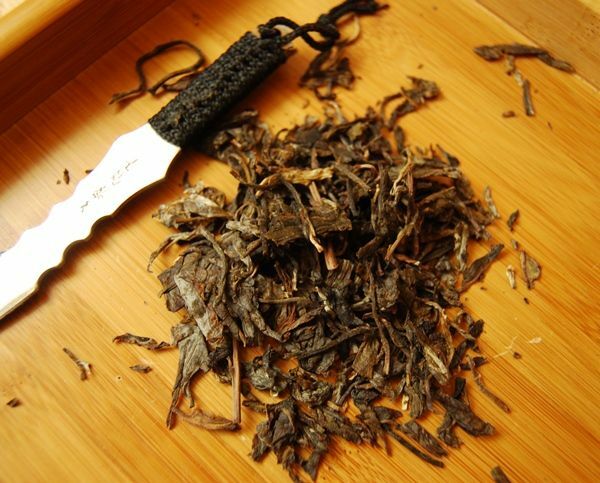 It has been blended well, which is a difficult skill to master, giving it complexity and interest without sacrificing body or potency. I have come to think quite fondly of Luxi Defeng cakes, and will continue to keep an eye on Taobao to see if this chap ever appears. It is a well-made blend, that stays big, bold, and clean. Even coming back to it the day after my original session, it remains penetrating, smooth, and rather water-drawing in its finish. Citric, sweet, heavily caffeinated. I can imagine running this cake forward in my mind, in comparison to other cakes that I have tried at similar and later stages, and suspect that it might lead to good results in future. There is a rather lot in it. Many thanks to Keng for the opportunity to try it. 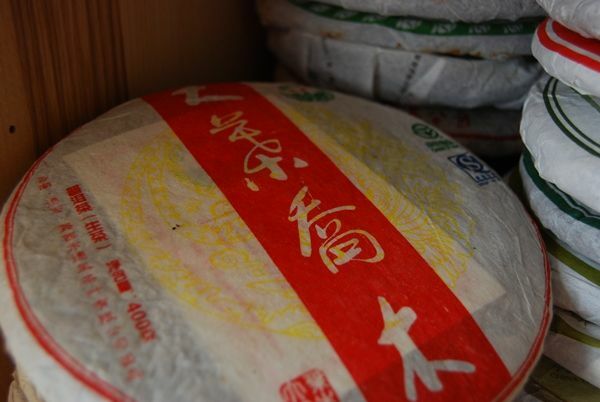 It's not every day that a cake from Dehong comes your way, which is a prefecture far north of Xishuangbanna, beyond Simao, beyond Lincang, beyond even Baoshan. It sticks out to the west, poking Burma / Myanmar in the ribs. 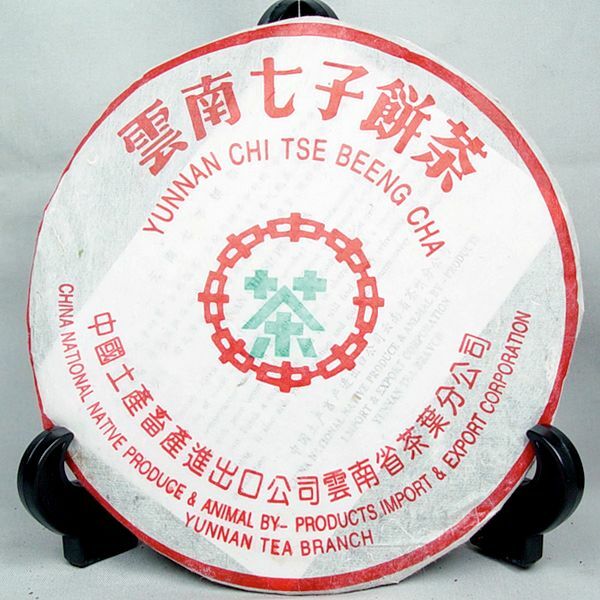 Various merchants selling via Taobao observe that the Luxi Defeng Tea Company, to give it its full name, has its own dedicated tea gardens, which cover some 30 acres, yielding some 2,600 tons of tea each year. 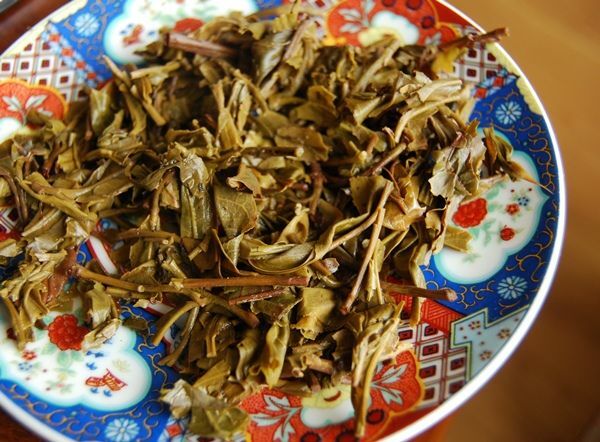 Happily, the local Luxi government has given the Defeng company a further 10,000 acres of land, which it uses for maocha. This is encouraging, as it demonstrates the recognisably significant effect (p < 10^-6) of the pu'ercha industry on local commerce, and on local livelihoods. "Pangxiejiao" [pung sh'yeah jee'ao, crab's feet] cakes supposedly contain some of the vine that grows around the trunk of the pu'ercha tree. 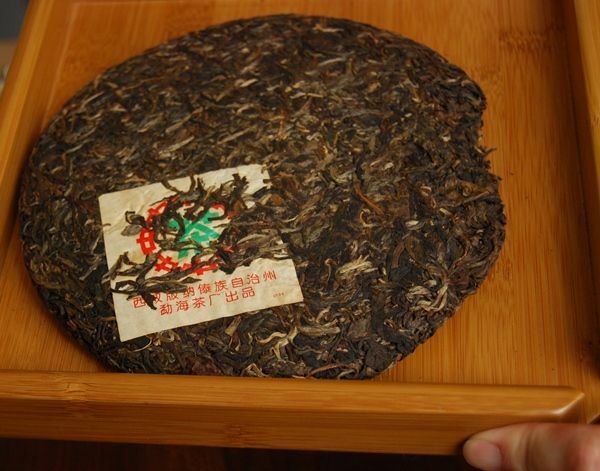 The only other example of this genre in our collection was, as with this cake, generously provided by Keng of Singapore - it is the 2003 Jingmai version, by Changtai. 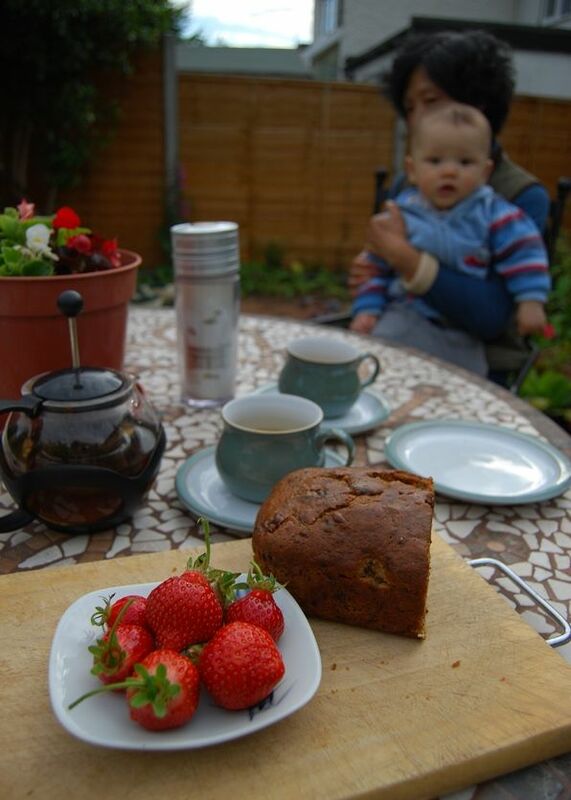 I couldn't discern any noticeably alien contribution to that tea - it simply tasted like a good, well-aged cake. 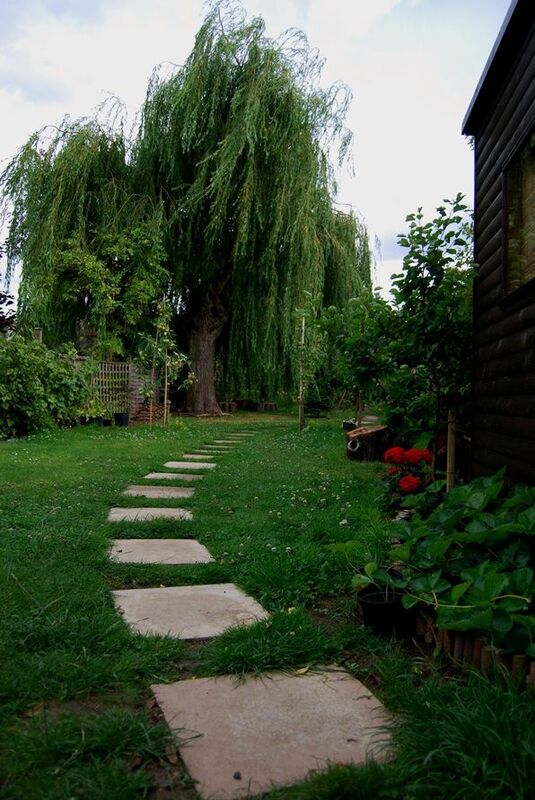 As you can see, the leaves are large and quite dark: every now and again, the pengxiejiao may be seen as a section of thin creeper. The aroma is light and sweet. So far, so good. Its rinse is a heartening yellow colour, with a hint of brown that is often a surprisingly accurate predictor of "savoury" character. 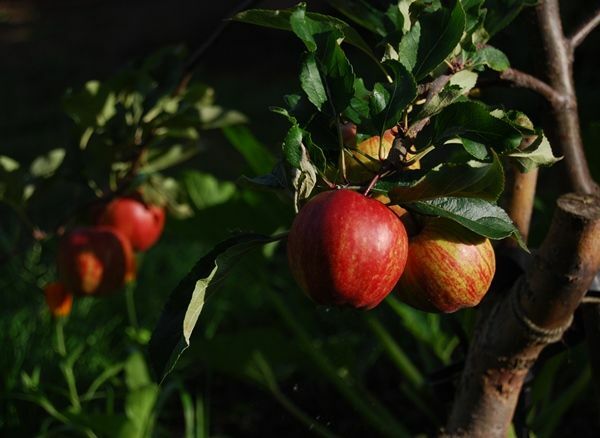 The scent is sweet, yet dry, like arable crops, with a fruity edge. This seems to be a very decent tea: it has a heavy sweetness that pushes its way into every corner of the mouth. The body is quite thick, and the huigan is significant. Its remote provenance grants it subtleties of character that are welcome: low tobacco, sweet grain. 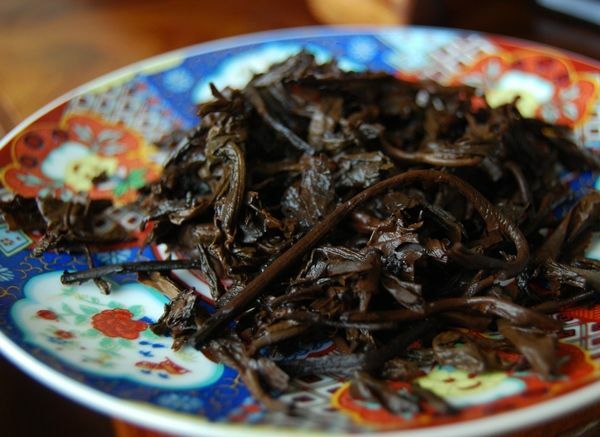 It reminds me of Dali-area Xiaguan leaves, which are, after all, closer to Dehong than 'Banna. This sells for a most 65-100 RMB on Taobao, which makes it worth a look, if you, like me, enjoy these cakes from remote regions. The price also lands you a 500g cake, rather than the usual 375g. Thanks once again to Keng. The probability of me enjoying this cake asymptotically approaches 1 on a short lengthscale. I did say that it was not all bad news with my four samples from Tearoma. After two oddly empty / strangely stored 8582s, and a Zhongcha tuocha that turned out to be shupu, it is beholden on the Mighty Xiaguan to redress the balance, and make everything right once again. Someone has to clean up this mess, so let it be Xiaguan. 8653 is a good, reliable recipe from a good, reliable factory. Not yet dreamt of, the various blackened modern Xiaguan incarnations. No, this old recipe is raw, uncompromising, and about as similar to modern "Big G" productions as heaven is to earth. Would it surprise you to learn that this is a "tiebing" [iron cake], fused together in the core of a dying star? I thought not. As ever, my trusty, rusty, 30cm-long crowbar comes to the rescue. The three chunks from Tearoma are pictured above - using the powers of Greyskull, I managed little more than to remove some fannings from one of them. I gave up, and resolved to let the Universal Solvent do its work. Choirs of cherubim and seraphim continually do cry: tasty, tasty, tasty. 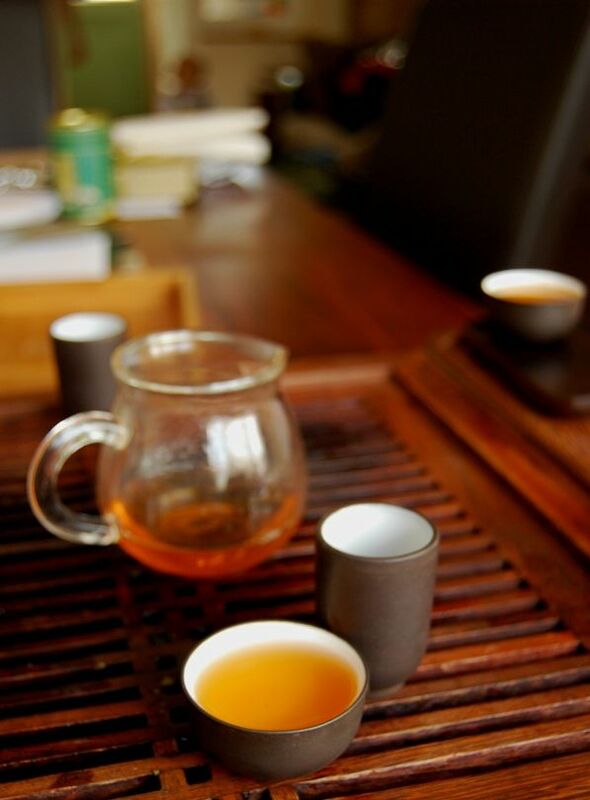 Aroma-cup and tasting-cup are full of its woodiness. Blessed is that tea that cometh in the name of such sharp, pine-like deliciousness. It cools the breath, it has plenty of energy. 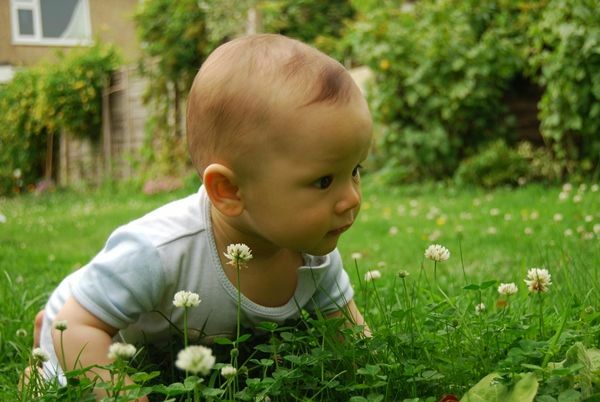 It reminds us that some things in the world are worth waiting for. This still has a long way to go, but its interim appearance is thick in the mouth, and very encouraging for its future prospects, given its density and overall level of activity and contents. At $48, this is a very safe purchase, for what we receive. Amen. 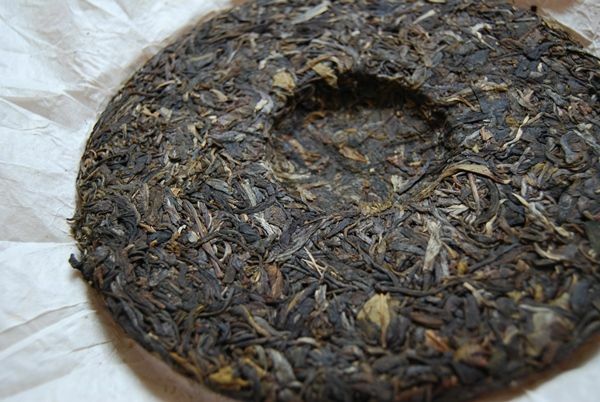 Addendum: it is likely that this cake is not from 2001, and it may or may not be Xiaguan (although its compression, leaf appearance, and flavour indicate that it probably is). Please see the comments for details. 2000 Changtai - Yichanghao "Jingpin"